Do you fix motorcycles and ATV's for a side job? Do you like to eBay®? Do you have your own store? Become a dealer for Rocky Mountain ATV/MC ! Dealer prices are available and viewable on our Rocky Mountain ATV/MC website when you have been accepted and are logged in with a Dealer ID and password. Here is how it works: On the product detail page, the retail price will be displayed. 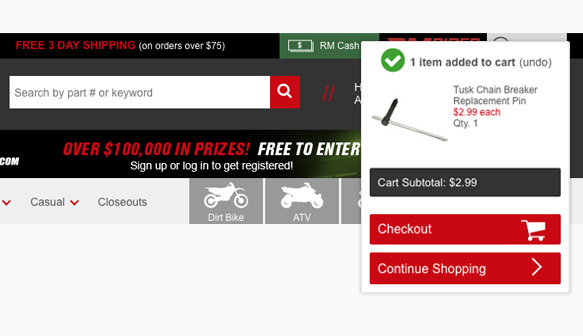 When you add an item to the cart, your special dealer price will show up in a shopping cart drop down banner at the top-right side of the page. From there, you will be able to go to the shopping cart and calculate your shipping total. Or you can see your pricing by logging into your dealer account and going to the dealer pricing list. We give you the capability to order product for your customers, on your time frame...24/7! Here is how it works: When checking out, you will have the ability to change the "ship to" address from your account default address to your customer's address. This flags the order as a "drop-ship" order. 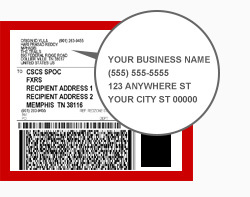 Your customer will not receive an invoice with pricing, but a packing slip that shows the details of the shipment for their reference. Your company's invoice will be sent with pricing to you by email confirmation unless you have removed the option on your account. If you're approved, you'll receive more information and details on how the program works and benefits that are included.